A former foreign minister and parliamentary deputy, Roza Otunbayeva helped push the unpopular Bakiyev family from power on a bloody day in April 2010. For the next 20 months, she was Kyrgyzstan’s interim leader. As she struggled to help Kyrgyzstan stand back on its feet, the country experienced the worst ethnic violence in a generation, the government seemed constantly on the verge of collapse, and heightened nationalist sentiments fueled protests almost daily outside her office. On December 1, 2011, Otunbayeva became the first leader of a Central Asian country to oversee a peaceful exchange of power. Last week Otunbayeva was in New York to celebrate the life of one of Kyrgyzstan’s most famous sons – the writer Chingiz Aitmatov – at Columbia University’s Harriman Institute, where Eurasianet is based. 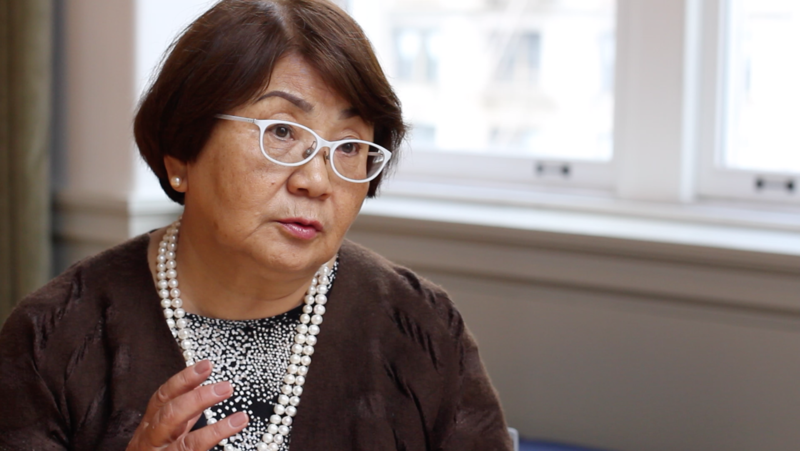 Otunbayeva sat down with Eurasianet’s Maria Mammina to discuss China, her successors’ rivalry, and regrets from her time in office. How has the rising influence of China affected Kyrgyzstan? And what do you envision happening in the future? The rise of China is generally a positive fact for Kyrgyzstan, because we have a region which has intensive trade and economic ties with China. China is the second economic power in the world; it’s a neighbor – a direct neighbor. It gives us a lot of good promises. China became a source of credits recently and China offered us a lot of assistance over this difficult transition time. […] So in this regard, China’s growing role in international affairs, this will be considered certainly as a positive fact. How can Kyrgyzstan take advantage of its position between China and Russia but still protect its sovereignty? It happens that we are in an organization: the Shanghai Cooperation Organization (SCO). Russia and China are both members. Plus the Central Asian countries, and now plus India and Pakistan. So it means that regarding security, we have common goals, common tasks, and common threats. And I am sure that [Kyrgyzstan’s position] will not be between two big elephants or foes, but we are gaining in this organization the advantages of both countries. Certainly there exist controversies, problems between those two countries, Russia and China. But as a strategic ally of Russia for many decades, Kyrgyzstan is in the position to find a way to deal with each of these countries. And also we have strategic relations with China and we want to solve our problems – today’s problems in economic and social affairs – according to the interests of both countries. Parliament is considering a bill on stripping immunity from Kyrgyzstan’s former presidents. You are both a former parliamentarian and a former president. How would you vote on this? Yes, parliament now has on the table this question about overriding the immunity of the president. And I – my position is if this will be a positive thing, I am not against it at all. My only wish is that it will be very – be for the sake of the whole country and all of our development. This is democracy, when parliament is voting for this issue and if this is accepted then it is all right. It doesn’t touch me, it doesn’t affect me, because I [haven’t] done anything wrong. Many Kyrgyzstan watchers are alarmed by the standoff between Almazbek Atambayev and the incumbent president, Sooronbai Jeenbekov. Do you fear Jeenbekov could seek to consolidate his power at the expense of democratic values? Why at the expense of democratic values? No. You are right, in the first part of the question, that both are today in controversy. In open controversy. […] but Atambayev wants to fight for his future, political future, and he mobilizes his party today, he mobilizes other political establishments for that. But I do believe that life goes forward – and certainly he has a right to fight against it – but I do believe that what was really a very negative and [unintelligible] Atambayev’s legacy, this should be gone. And I do support what today [the] progressive part of our political elite is doing and mobilizing for. What is your proudest accomplishment of your presidency? I think first of all that we fixed the problem of 2010, that the conflict between the Kyrgyz and Uzbek ethnic groups in 2010, in June 2010, was fixed in a couple of days. […] we managed to fix this problem and then we fixed also the problem when hundreds and hundreds of people left Kyrgyz territory for Uzbekistan and we managed to receive them again. I think probably the real achievement was that we have adopted the new constitution which turned my country toward parliamentarianism. So this is the most important. And we have today, in the whole region, only one country that has parliamentarianism. What regrets — if any — do you have? It was such a controversial time — a lot of regrets. But what I’ve done is what we could do at that time, because [there were] a lot of tensions between parties, political leaders, and between the regions and also political forces. And so of course, if we’ll have a strong political force which will consolidate everyone, [it would have been] much easier to overcome all these problems. But unfortunately it wasn’t such a time. So we lost people. We had human losses, a lot of property losses, and generally it was very — such a bloody time. It was really a very difficult time. I regret very much that it happened. And because also, we couldn’t fix this on time and properly — so I really regret it. My condolences to all those people. But generally we fixed this in a very short time. We have conducted elections which restored all the branches of power. And so that’s how we got out of the crisis. What about the fate of human-rights activist Azimjan Askarov? His imprisonment continues to be a blight on Kyrgyzstan’s record. Do you have any regrets there? No — I regret [this], but it was a decision of our court. And this court’s decision was [upheld]. And the international community’s pressure came to our country, and the court revisited [Askarov’s case] and came again to this decision — the decision for him stay in prison. So far that we have a court, this is our justice system. Why didn’t you pardon him at the end of your presidency? It was a decision that [would] again [have broken] the country. I mean, the stability of the country, political consensus within the country was very much bound to such a touchy issue. And it was a very high price. Maria Mammina is Eurasianet's digital content editor and a Brooklyn-based photographer.